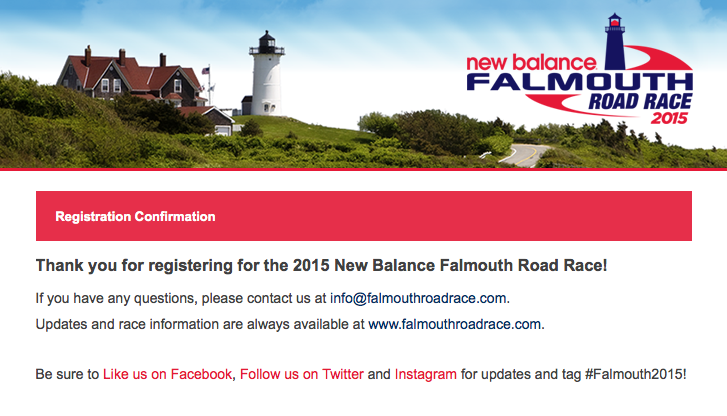 I was holding off on telling anyone until it was official but now IT’S OFFICIAL: I’m running Falmouth this year! Working in the office for so many years, I only had the opportunity to actually run the race a couple times so I am excited to join the 10,000 other runners for the 43rd running of the Falmouth Road Race on August 16th. Less than 8 weeks away, it’s time to develop a training plan! Are you running Falmouth this year? Registration is closed but you can still sign up to volunteer on race day or run virtually. Check out the road race website for more information.